- HD graphics on iPad! When zoomed in (2X) you get beautiful, high resolution graphics when playing! - Bug fix: Fix for Facebook highscore sharing. Also faster and easier posting to your Facebook profile! Or at least you will be giggling with joy as you fly across beautiful, hand-painted worlds, collecting rings to stay alive and activate awesome superpowers! 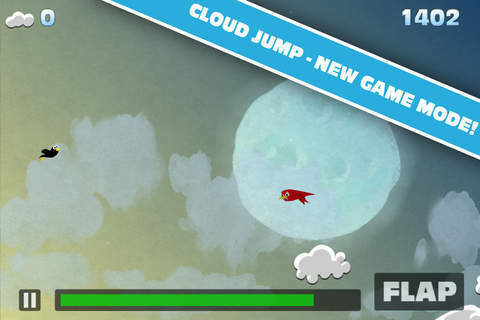 Or you can play the super-addictive Cloud Jump mode where you bounce on clouds and link together jumps to unleash an amazing electroboost that will send you screaming across the skies! - Fun and easy to control! - Two games for the price of one! - Wonderful, handpainted graphics and catchy chiptune music! - Addictive, fun, easy-to-enjoy gameplay! - Heaps of Game Center Achievements and Leaderboards to kick your friend's.. scores! - HD Retina graphics and HD graphics on iPad when run in 2x mode! Woot! Read the reviews: This game has been played and enjoyed by loads of people - now it's your chance to experience Flap Flap!